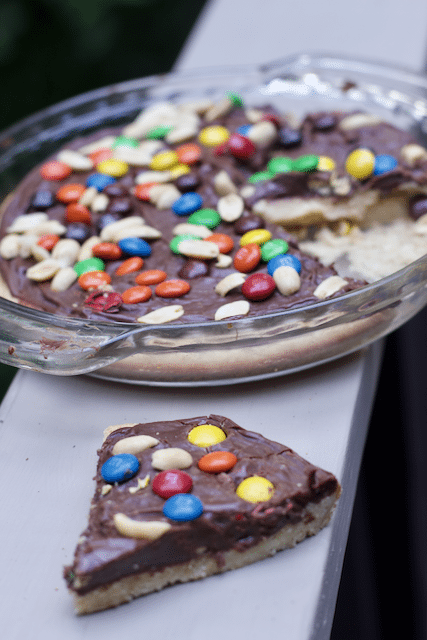 Deliciously Easy Pizza Cookie Recipe is as yummy for the kids as it is for adults. I remember getting one of these pizza cookies when I had a baby and a neighbor brought us dinner. This was our dessert. These pizza cookies are great to make with the kids since they can top the cookies just like homemade pizzas. They are also big enough to bring to a pot luck dinner since they are the size of a pie plate. We took a short cut and used packaged sugar cookie mix but feel free to make a batch of your homemade sugar cookie dough if you have the time. This post contains affiliate links, by clicking on them I receive a small kick back! The recipe originally called for two 12 inch pizza trays, but since we don’t have any, we used two 9-inch glass pie plates. Just be sure to grease them so the dough doesn’t stick. They may be thicker than the pizza pans but no one will complain. 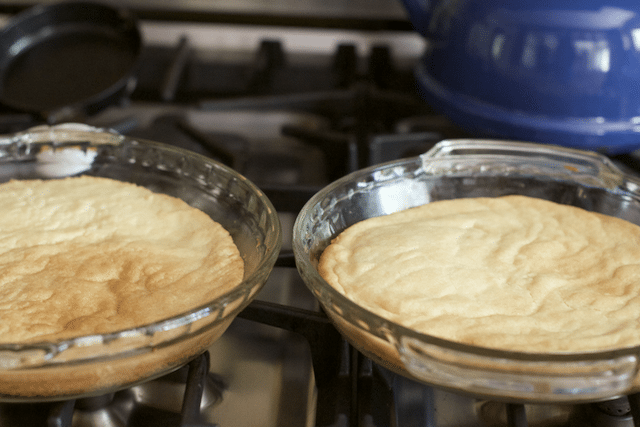 Divide your sugar cookie dough evenly between the two pie plates. Press the dough to create a smooth surface. Bake for 12-15 minutes or until slightly golden brown. If you use glass plates you can check the bottoms to make sure they don’t burn. 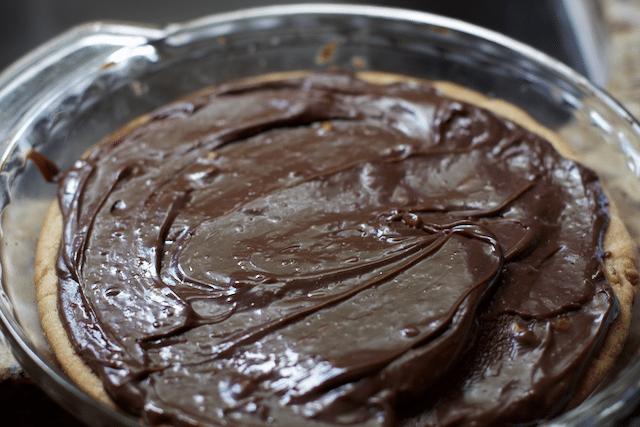 While the pizza cookie crusts are baking, make your pizza sauce, aka fudge topping. Melt chocolate and evaporated milk until the mixture is smooth. Top your crusts with the fudge mixture just as you would pizza sauce. 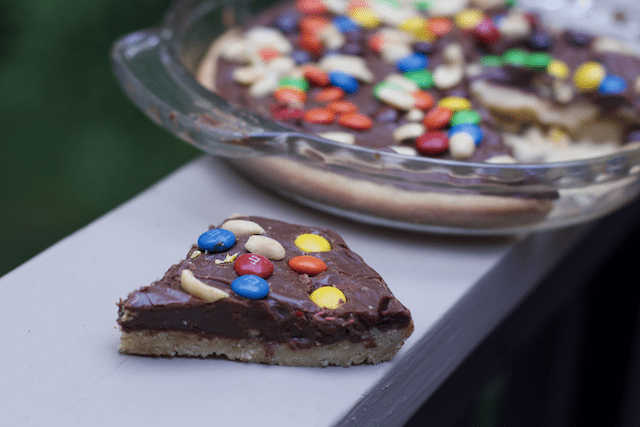 Immediately top your cookie pizza with yummy toppings. We chose peanuts and M&M’s. But go crazy with any candy combination your family desires. 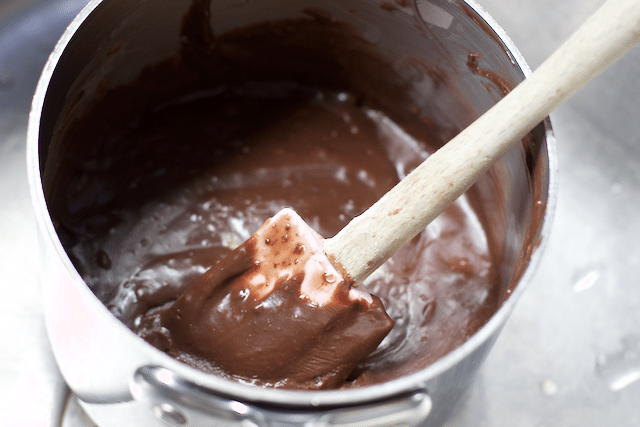 Lightly press the toppings into your fudge topping. 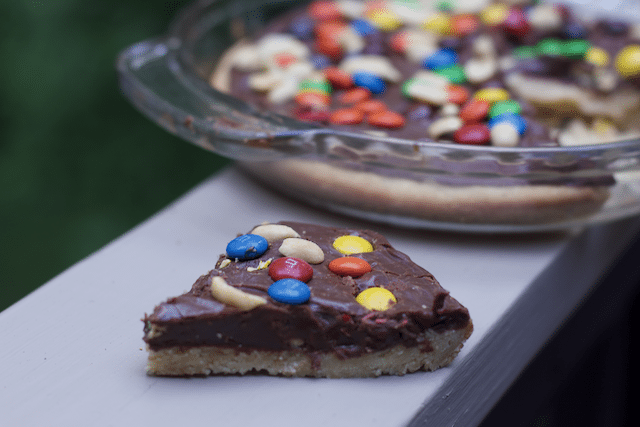 Allow the pizza cookie to cool and then slice it up for a Deliciously Easy Pizza Cookie the whole family will enjoy. Do you think your family will enjoy this type of dessert. 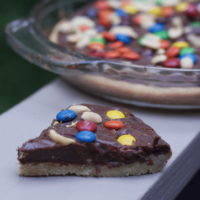 I can’t wait to make it for a party and watch the kids devour a slice or two! 1. Preheat oven to 375 degrees F. Make cookie dough per the package directions and divide dough into 2 ungreased 9 inch pie dishes. Bake 10-15 minutes or until golden. Remove from oven. 2. In medium sauce pan, melt chips and condensed milk until smooth. Spread evenly over cookie crusts. 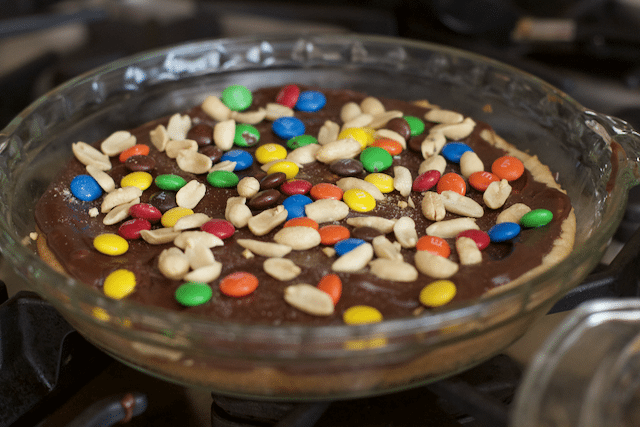 Sprinkle with M &M's and peanuts. 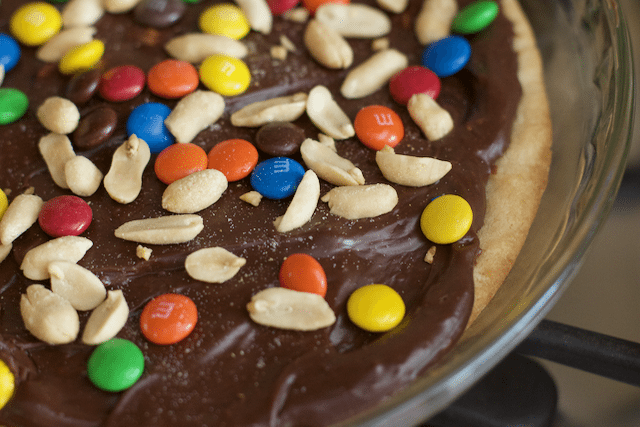 What type of toppings will you put on top of your pizza cookie? « Brighten Up Outdoor Party Space With Color Changing LED Rope Lights!